An RAAF KC-30A tanker-transport has refuelled an F-35 Joint Strike Fighter for the first time. During a four hour test flight from Edwards Air Force Base on September 25 KC-30A A39-001 made 59 ‘contacts’ with F-35A development aircraft AF-4, five of which were ‘wet’, transferring a total of 42,000lb of fuel, Defence announced in a statement on Tuesday. “Refuelling between the KC-30A and F-35A is an important step towards the KC-30A’s achievement of final operational capability (FOC) and represents continued progress in the development of the F‑35A,” Chief of Air Force Air Marshal Leo Davies said. Strange seeing a fighter take fuel through the centre fuselage. Awesome stuff. Glad to see that boom doing it thing! Um G4 The f16, F22 take fuel on the centreline.!! Very nice camera shots, and agree, Centreline fuel acceptance seems strange, but an ideal line setup I’d say. Using the boom (ARBS) and centreline receptacle (UARRSI) is the new way, replacing the older hose-and-drogue method. 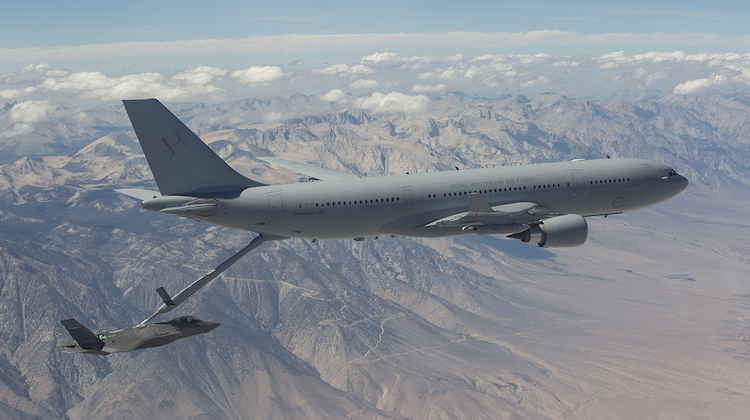 The RAAF’s KC-30 MRTT’s have both, allowing the refuelling of aircraft with either type. 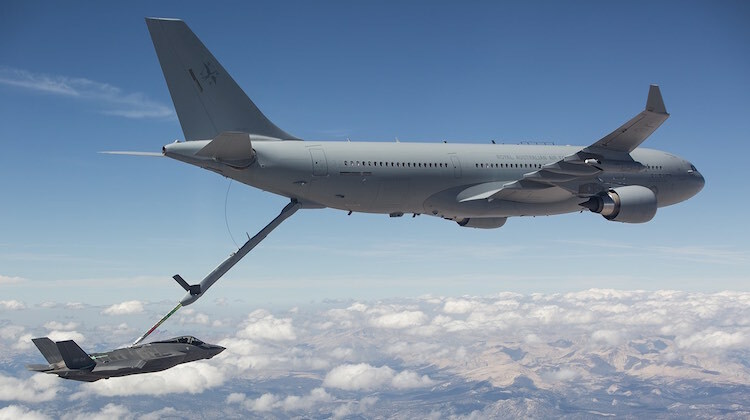 Your description of the two refuelling methods, ‘old’ and ‘new’, doesn’t really tell the true picture of the differences and reasons for both methods of aerial refuelling. In reality both methods were developed in the late 1940’s / early 1950’s, and yes the probe and drogue method did come first, but only by a short few years. And yes today the USAF uses the boom system, but the USN and most Air Forces around the world still use the probe and drogue method, but that wasn’t always the case…. The USAF did in fact adopt the probe and drogue system initially, but the reason the boom method was introduced, and eventually adopted as the USAF, was because of the demands made by General Curtis LeMay, the head of the US Strategic Air Command (SAC). LeMay wanted a system where the large bombers of SAC could be aerial refuelled at a ‘very fast flow rate’, hence the boom systems was developed and also adopted by the USAF, on the other hand the USN stuck to the probe and drogue system, and it is still in use by the USN today. So what you say? There are pro’s and con’s for both methods, yes the boom system will allow for a fast flow rate to be used when refuelling ‘large’ aircraft such as, B-52, B-1, B-2, C-17, C-5, P-8A, etc, all good and well. But on the other hand ‘fighter’ sized aircraft are ‘unable’ to accept the fuel at the same faster flow rate of much larger aircraft, so the differences in capability between both systems is actually narrowed down due to the ability (or inability) of the receiving fighter sized aircraft to accept the fuel into its tanks at such a high rate. And how that applies to the RAAF is pretty simple, The Classic Hornets, Super Hornets and Growlers are all of USN origin, therefore the probe and drogue system, the F-35A, being of USAF origin, well then it’s the boom system, it is as simple as that, if we were for example to have procured either the F-35B or C, then the system of aerial refuelling would be the probe and drogue system. Not to say we shouldn’t have both systems available, probe and drogue for the Supers and Growlers and boom for the rest of the fleet, including the F-35A. In reality a KC-30A will be able to ‘top up’ two Supers or Growlers faster than it will be to top up two F-35A’s, and the reason for that is simple, despite the ability of the F-35A to accept fuel at a ‘faster’ rate using the boom, but not the ‘full’ rate, there can only be one F-35A hooked up to the boom at the one time, on the other hand, two Supers or Growlers can be hooked up under each wing at the same time. Thanks John, for your at-length and enlightening comment… perhaps I could have been a little more explanatory, however I was just trying to keep it brief and simple! Interesting that the F-35B and C variants have refueling probes – I didn’t know that. At least the RAAF’s KC-30A’s have both, so that’s great.